Man its been cold we are now booking for the new year not been alot going on with the bad weather. Thing should get back better with warmer weather..
Big Wahoo bitting good in the Stream be out there next week. Weather will not let up.O-well Fishhook II is back in the water now with new paint job ready to go. Ok sick of winter,I cancel my trip today maybe I can go tomorrow. Finaly had a calm day 3/4 day trip caught some sea bass and spiny sharks.We had 20 nice keepers the water temp is cold made fishing a little tuff. Been in Washington D.C. on Capital hill to fight for our fishing rights in America. Black Sea Bass and sharks with group from Wisconsin down on bachelor trip 3/4 day. 1/2 day These young boys had fun today with the Sharks and Sea Bass. "Granny",Family from Kentucky had a fun day catching Sea Bass and "Spiny Dog Sharks"
Good 3/4 day trip Group from Ball State University Indiana caught a mess of Big Sea Bass and Sharks. Group from NC with some keepers out of alot of Sea Bass and Shaks today on 1/2 day trip. Afternoon trip more dog fish , fun for the kids. Finally Sharks let me get a keeper Sea Bass. The Toataog are inshore with the sea bass caught two today with some keeper sea bass on 1/2 day afternoon. Sea Bass, Ive got my fish for dinner. Thease little guys hade some Keeper Sea Bass and alot of Sharks. Big catch of Sea Bass today on 9hr offshore trip. Finally the tuna are here on 1/2 day trips and 3/4 day.They give a good fight on light tackle. Nice Catch of Sea Bass today on 8 hr trip. Sea Bass in the rain on 1/2 day trip today.Time for the Mackeral to show up. Capt Richard Long on the Fish Hook II had good 8 hr trip today with group from Charlotte N.C. Proofs in the pudding.Exceptional day with Capt Richard Long on the Fish Hook II.Snapper,Grouper and Sea Bass.Season open now for Grouper. Spanish Mackerel and King Mackerel biting good on 1/2 day trips and Sea Bass. Black Tip sharks caught today on the Fishhook, 1/2 day trip they are on the beach now..
Trolling was slow today in the Gulf Stream on the fishhook but went to bottom fishing to end up with a basket full of Big Sea Bass and Snapper. 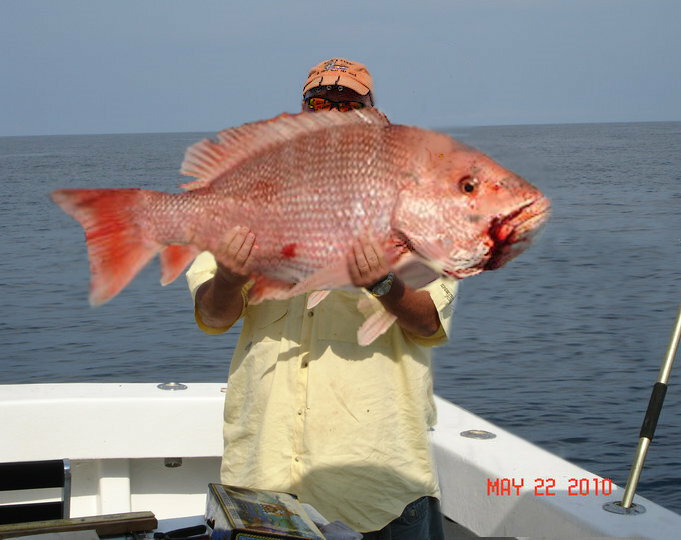 One big Red Snapper caught with Richard Long on the Fishhook II. Capt Mark from Butterbeans Guide Service @ www.santeecoopercatfishing.com caught it. On the Fishhook 1 we caught Spanish Mackerel today and Sharks. Good Catchs of Spanish Mackeral and sharks today on both boats.Time to catch Black tip Sharks they are on the beach. On the Fishhook,good catches of sharks and bigger Spanish Mackeral close to beach on 1/2 day trips.